You can do the first 3 stretches to begin stretching the muscles that run along the outside of your hip. 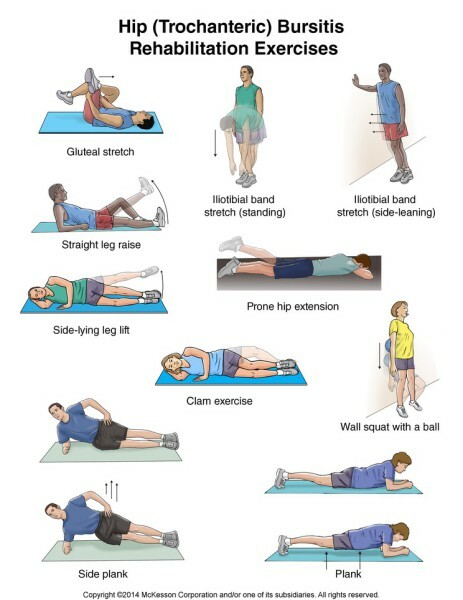 You can do the strengthening exercises when the sharp pain lessens. Iliotibial band stretch, standing: Cross your uninjured leg in front of the other leg and bend down and reach toward the inside of your back foot. Do not bend your knees. Hold this position for 15 to 30 seconds. Return to the starting position. Repeat 3 times. Iliotibial band stretch, side-leaning: Stand sideways near a wall with your injured side closest to the wall. Place a hand on the wall for support. Cross the leg farther from the wall over the other leg. Keep the foot closest to the wall flat on the floor. Lean your hips into the wall. Hold the stretch for 15 to 30 seconds. Repeat 3 times.